Invacare Birdie Folding Electric Hoist Comfort lift. With the Birdie and Birdie Compact hoists transportability and patient comfort go hand-in-hand. With maximum space for the user, both the Invacare Birdie and the Birdie Compact hoists offer a truly comfortable lift and transfer to or from beds, chairs or even the floor. The lifters are designed to ensure that folding and unfolding can be carried out easily and without the need for tools. In addition, the lifter can be dismantled into two parts if needed – also without tools. Total User Comfort: Providing plenty of space for the user even when the hoist is in the highest position, this provides a very comfortable lift and transfer. The user can also be easily rotated in the hoist which allows placing the user into the bed/wheelchair much easier for the carer. Optimising space for the user creates a high level of comfort and ensures that the users knee’s are not too close to the actuator of the hoist, which means that there is a very low risk of injury. Ease of Handling – Simple to Fold, Unfold and Dismantle: The hoist can easily be folded and unfolded without the need for tools. The hoist will require minimal space when stored and is very easy to push and transport. If required the mast and boom can be easily detached from the base (no tools required). TUV Certification for Maximum Security: For total security, the hoists have a snap lock system to minimise the risk of accidents. The hoists are CE Certified in line with the Medical Device Directive 93/42/ECC. 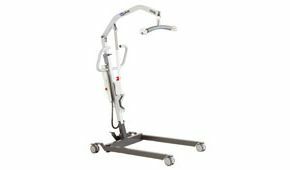 To ensure the hoists comply with EN ISO 10535, the hoists have been rigorously tested by Invacare and the German TUV Institute, an accredited external body. Configured to User Needs: Users can enjoy maximum flexibility with a range of spreader bars and a very comfortable sling range which allows for individual adjustment of the transfer. I purchase this for our new home in the North East,with the help of daughter we now have it set up,charged up and already to roll,the only thing that is negetive is the area of the legs when open they dont open wide enough to hoist my daughter to the sofa....so very disappointing on that part. But other wise at the present this hoist is working ok,i did the research 1st before i brought it and brought from this shop because at the time they were the nearest to my new address and the transaction on line went smoothly so no worries. Just remember when buying a hoist do the research 1st and see which one is better suited for your needs.